Why am I getting Invalid Social Security Number error during the enrollment process? What if I want to revoke access to my MyChart account I’ve given to a family member? Who do I contact if I am experiencing problems with this website? Request appointments at your physician's office. View your test results and health summary from the MyChart electronic health record. Communicate electronically and securely with your physician office care team. Patients will be issued a MyChart activation code during their office visit. This code will enable you to login and create your own user ID and password. If you have lost your activation code or it has expired, you may request a new code from your Healthcare provider office. Why am I getting Invalid Social Security Number error during enrollment process? First verify that you have entered in the last 4 digits of your social security number correctly. If it was entered correctly, you may have missing or incorrect information listed in our system. Contact the Franciscan Health facility that issued the activation code to validate or correct the information. Most lab results ordered during your visit will be automatically released after 24 hours. Providers may not have reviewed the results that are automatically released to MyChart. Only lab tests ordered after the MyChart account activation will be available in MyChart for viewing. Your Healthcare provider is able to determine which types of test results are released through MyChart. Further, tests of a very sensitive nature are not released in MyChart without a conversation first with your physician. Your MyChart information comes directly from your electronic medical record. Contact the Franciscan Health facility that delivered inaccurate information. You will generally receive an answer within one to three business days during normal office hours. MyChart should not be used for urgent situations. Please call your physician if the situation requires immediate attention, or dial 911 if it is an emergency. Yes. 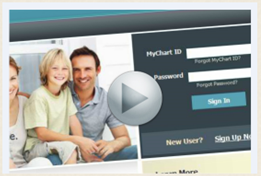 This is called proxy access and allows a parent (or guardian) to log into their personal MyChart account, and then connect to information regarding their family member. Enrollment for proxy access is available at your physician's office or through a Franciscan Health hospital HIM department. During your next physician office visit, complete a MyChart Proxy Consent Form to request access to this convenient service. For adults, such as your spouse, each adult must sign and submit a Release of Information request and establish his or her own MyChart account. If a patient above the age of 12 wishes to grant MyChart proxy access to another individual, they will first establish his or her own MyChart account. Then they will complete a MyChart Release of Information Consent form to grant access to the designated proxy. Your physician's office can assist you with this. Yes, if you are signed up as a proxy for that family member. Click on Family Records and select the family member. You can then send the question to the appropriate provider. It is very important to access your family member's account because any communication with your provider from your account will be placed in your health record. This information would not appear in the correct health record and could potentially jeopardize medical care. What if I want to revoke access to my MyChart account I've given to a family member? To revoke access to your MyChart, log into MyChart and from the left menu, go to the My Family's Records section and select Family Access Settings. Finally, select the name of the proxy you no longer want to have access and click the revoke access button. Click the "Forgot password" link on the sign-in page to reset your password online. You can request a new access code by contacting your Healthcare provider office. To update personal information such as e-mail or password, log into MyChart and from the left menu, go to the Preferences section and select the appropriate option. We take great care to ensure your health information is kept private and secure. Access to information is controlled through secure access codes, personal ID's, and passwords. Each person controls their password, and the account cannot be accessed without that password. Further, MyChart uses the latest 1024-bit RSA encryption technology with no caching to automatically encrypt your session with MyChart. Unlike conventional e-mail, all MyChart messaging is done while you are securely logged on to our website. You need access to a computer connected to the Internet and an up-to-date browser (such as Internet Explorer version 7 or above 8). For your security, your access code expires after 60 days and is no longer valid after the first time you use it. If you still have problems, you will need to return to your physician's office to obtain a new activation code. You can call our MyChart Call Center at 1-877-900-5741 between 6:00am and 9:00pm CT or 7:00am and 10:00pm ET.